What are one's experiences after being diagnosed with Multiple Sclerosis in your twenties during the peak of your social life? How do you begin to live your new life in a body that is familiar and yours, but now feels foreign? 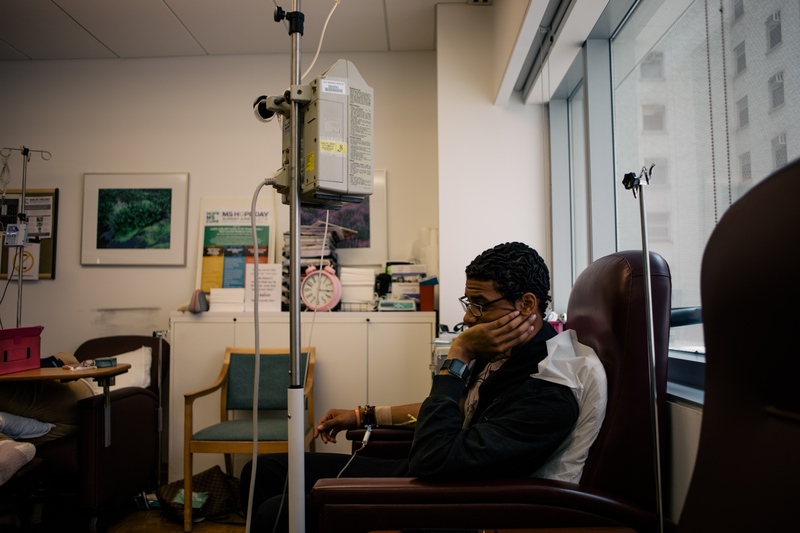 Alvarado’s photographs document Robert Sanganoo’s daily life and adversities living with Relapsing-Remitting Multiple Sclerosis over the course of two years. 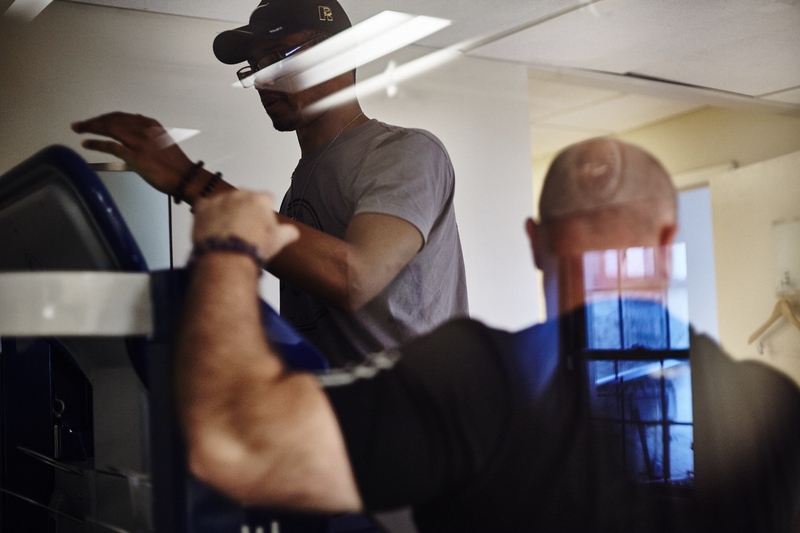 At a time when most adults in their twenties are pursuing a career and meeting significant people, Robert takes his days at a pace unimaginable to the normal person. 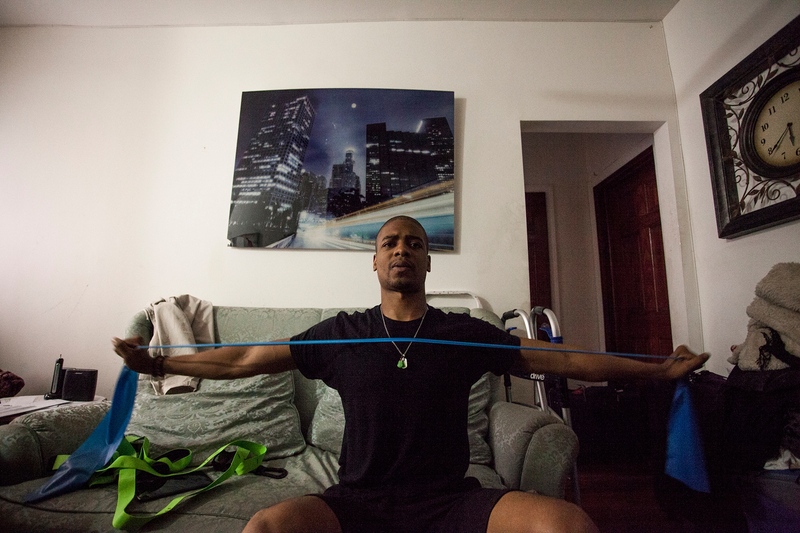 From physical therapy to at home workouts, Robert wants to no longer just survive this disease. Having navigated a significant distance from the day he was first diagnosed, this positive direction comes at a time when our state of government in regards to health care may look to hinder the lives of our sick. Unable to work due to his body’s condition, Robert is dependent on the health care our government supplies, with a rift to it bringing serious repercussion for him and his progression towards a productive life. This essay will be his first time openly speaking about his battle with anyone outside family and people sharing the same fight. With the purpose to open more conversations about this disease and to continue finding a cure. 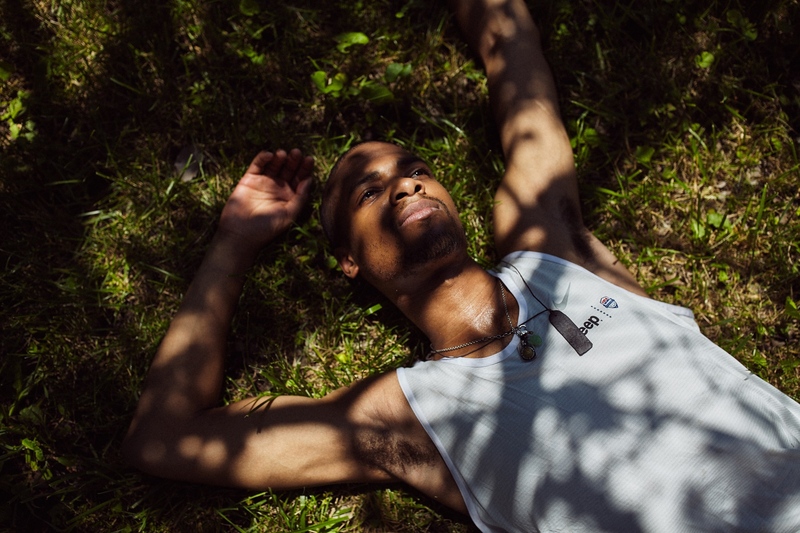 The hot and humid weather leaves Robert weak and susceptible to “flares” in his condition erasing months of progress and bringing him back to square one. The Bronx, NYC, 2017. 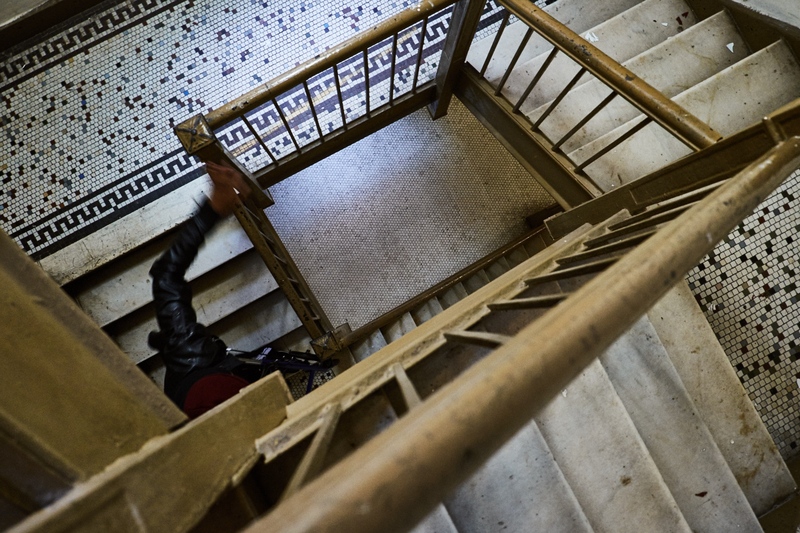 After a long day of doctors appointments and physical therapy, Robert makes the difficult journey up to his room on the top floor of his Mother's apartment in the Bronx. The Bronx, New York, 2017. 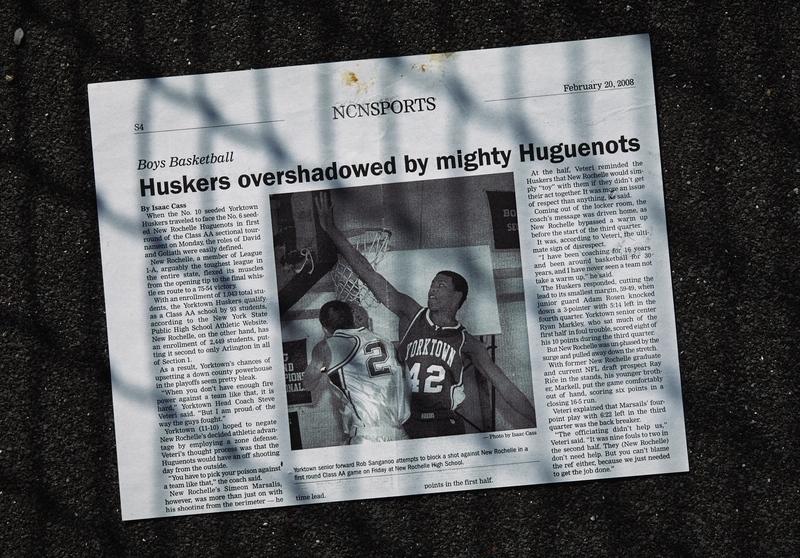 A still-life of a front page from an old local newspaper displaying Robert playing basketball for his high school basketball. This story was published months before being diagnosed with Relapsing-Remitting Multiple Sclerosis. The Bronx, NYC, 2017. 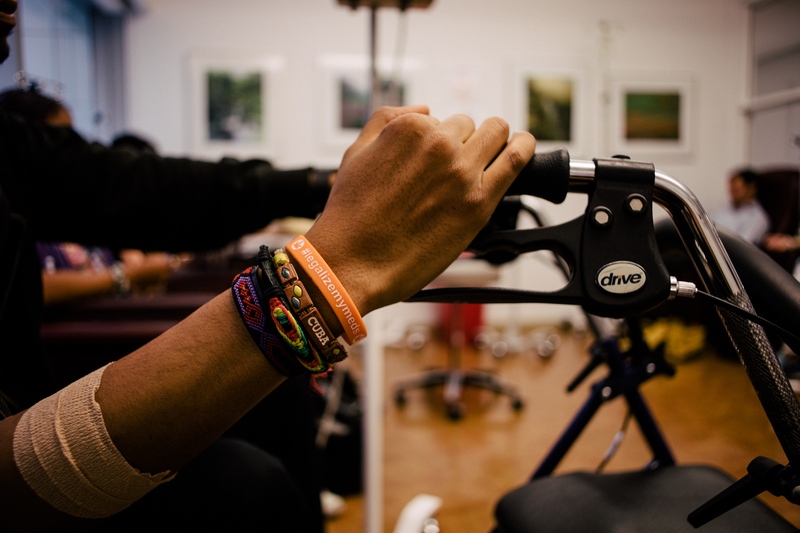 “I was first diagnosed with relapsing-remitting multiple sclerosis in 2011 at the age of 21. Prior to my diagnosis, I had been an active person, playing sports my entire life." 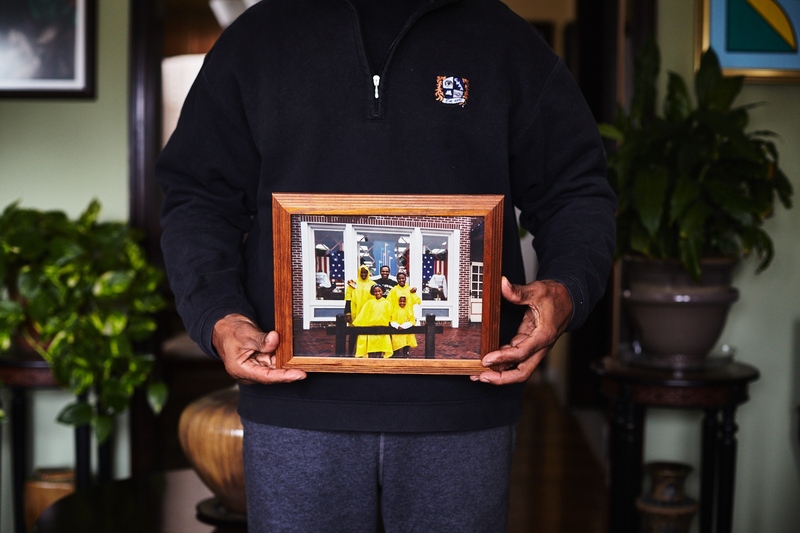 Robert's Father, Robert Sr. holds a family photograph taken during a vacation to an amusement park. Before moving to the Bronx, Robert spent 20 years living with his Father in Yorktown Heights. This town is the same town that started his sports career when he became part of their varsity basketball and football team. Yorktown Heights, NY, 2017. Robert completes workouts in the small confines of his sisters Manhattan apartment. Robert performs these workouts in order to slow the progression of RRMS. Manhattan, NYC, 2016. 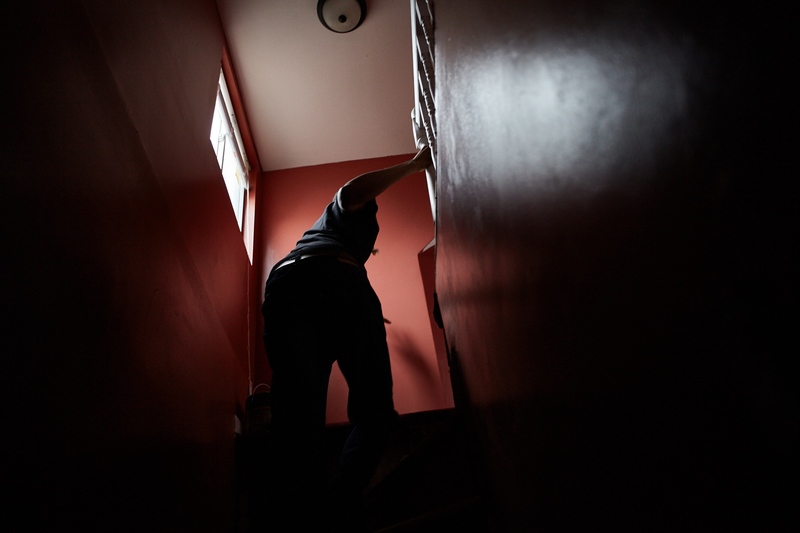 Robert climbs down four flights of stair to the front entrance three times a week in order to attend his doctor appointments and physical therapy sessions. Manhattan, NYC, 2016. "I began doing some personal research, but even with the information I have read, I am still ill-informed on the disease I am facing." Robert sits for the second part of his Ocrevus infusion. Ocrevus is the latest treatment Robert has received to help combat the symptoms attributed to Relapsing-Remitting Multiple Sclerosis. After today's treatment, Robert and his sister Shyvonne spent the remainder of the afternoon sitting on a park bench on the riverfront taking in the cool winds coming off the East River's waters. Manhattan, NYC, 2018. 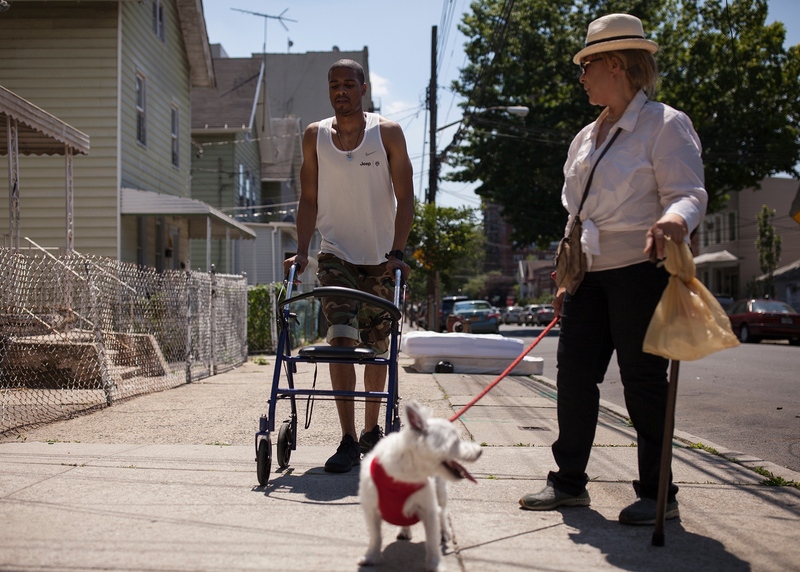 Robert and his Mother walk their dog “Wifi” around the block in a rare moment of bonding between the two. The Bronx, NYC, 2017. With the help of an anti-gravity treadmill, Robert walks effortlessly at his weekly physical therapy session. Manhattan, NYC, 2016. Robert’s blood is drawn monthly to help monitor his body for any side effects attributed to his yearly infusion of Lemtrada; a treatment used to combat the progression of Multiple Sclerosis. Manhattan, NYC, 2017. Everyday tasks such as getting a haircut or depositing a check take much of Robert’s day due to his low mobility and dependence to car services that need to be scheduled a day in advance. 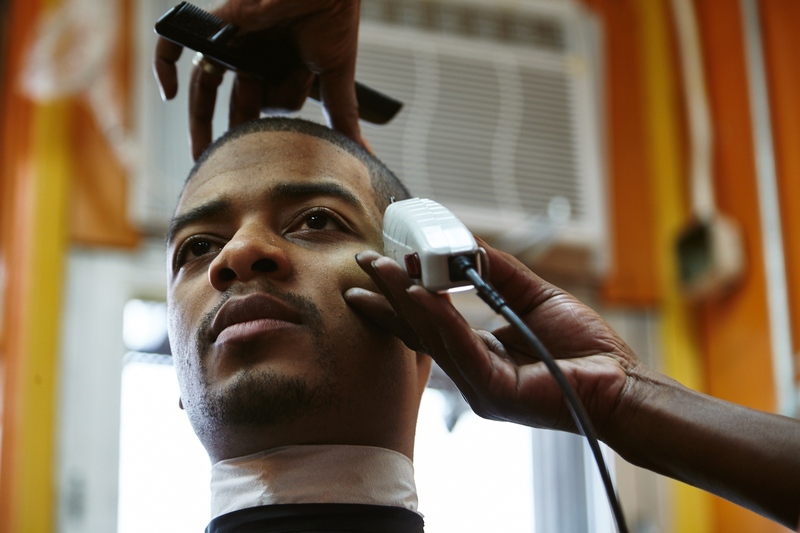 Here Robert stops at a local barbershop in the Gun Hill neighborhood of The Bronx for his haircut before a family party. The Bronx, NYC, 2017. "Once I was diagnosed my body began to quickly change. My mobility started to deteriorate and I haven’t been able to run since. I’ve been stuck in a depressive state stemming from even before knowing I had Multiple Sclerosis." Robert holds himself up with the help of water pipes hanging overhead as he cools off from the summer heat. The Bronx, NYC, 2017. As the year starts to wind down Robert has started to become part of the MS community by attending as many events as possible. As one of the younger members diagnosed with MS, Robert feels many in the groups look to him as the bridge between those impacted by the disease at a young age. 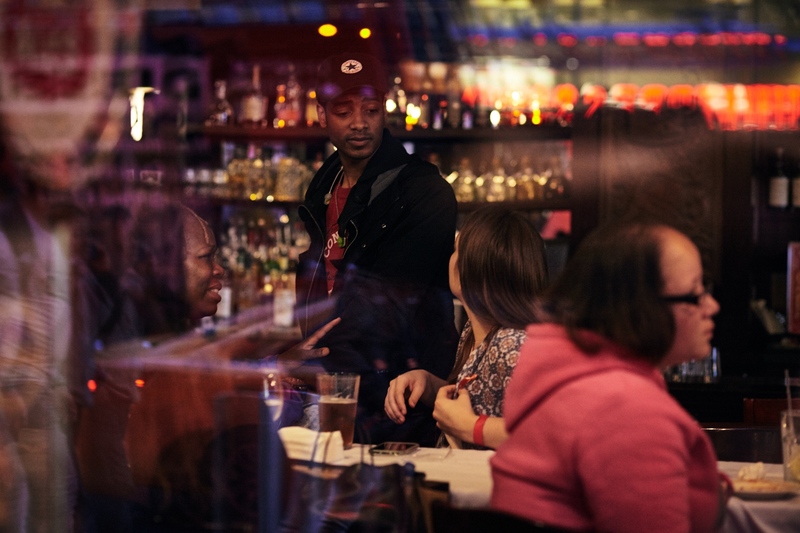 Here Robert speaks with supporters and friends during an MS Hope rally in Midtown, Manhattan. Manhattan, NYC, 2016. 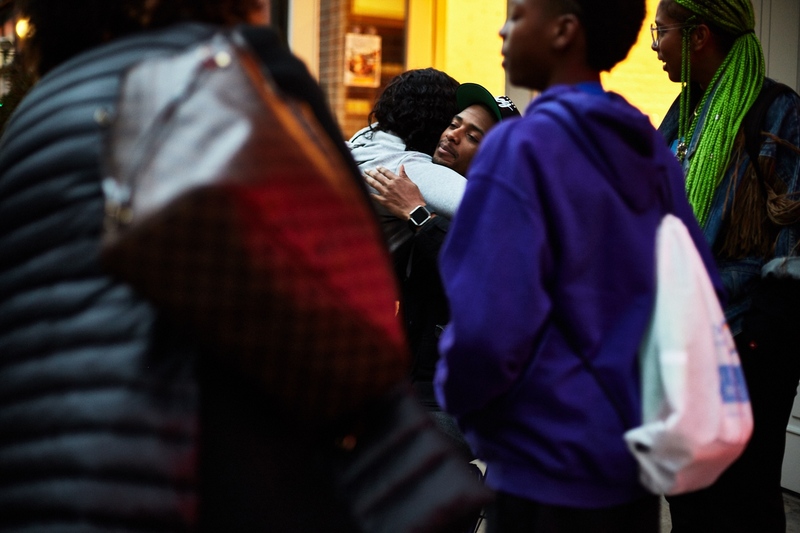 Robert embraces family and friends after MS Day in Uptown Manhattan. Manhattan, NYC, 2017. Robert S Sanganoo Jr, New York City, 2012; National Multiple Sclerosis Society, Southern New York Chapter. 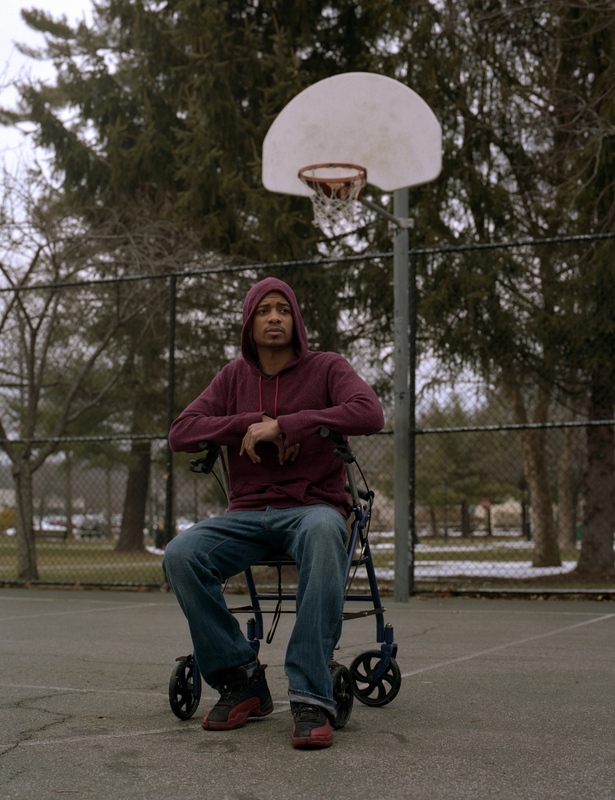 Robert sits at a basketball court that he would spend endless hours perfecting his layups and free throws prior to being diagnosed with MS. Yorktown Heights, NY, 2017.